At SFA, we not only work every day to help improve your business, but also to preserve our business history. Our industrial automation solutions are explored by various publications. In MFG News, we have appeared a few times recently. In this month’s issue (February 2017), we have a press release on Bigfoot CMMS (page 18 of the West Edition) and in the Southwest Edition, we have an ad about our machine monitoring solutions. Speaking of the aforementioned MFG News, we were also in their December 2016 issue (all Editions) talking about our character Shop Floor Man and social media in the manufacturing industry, which you can read about here. Modern Machine Shop also gave a nice mention to Shop Floor Man in this blog here. 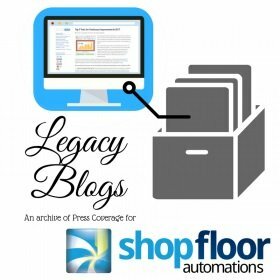 Want to know ways to increase your shop floor’s OEE and productivity without investing in new machines? Call (877) 611-5825 or use the chat function on our site to see how we can help! You may also fill out this Contact Form.